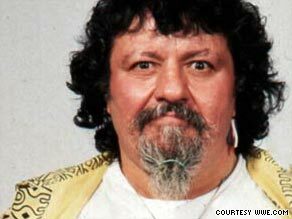 Albano appeared in video for "Girls Just Want to Have Fun"
He was also voice of one of the Marios in "Super Mario Bros. Super Show"
(CNN) -- Legendary wrestling figure Captain Lou Albano, perhaps best known for his association with pop singer Cyndi Lauper, died Wednesday, according to World Wrestling Entertainment. Captain Lou Albano reached a new level of fame in the '80s with his association with Cyndi Lauper. Albano, 76, was "one of the company's most popular and charismatic legends," the company said in a statement. The cause of death was not immediately disclosed. "Albano began his storied career with Vincent J. McMahon in the 1960s as one half of 'The Sicilians' tag team with his partner Tony Altimore," the WWE said. "He will be greatly missed by the WWE and his fans." Albano, who was with the WWE from 1983 to 1996, was inducted into the WWE Hall of Fame in 1996. He started as a tag team wrestler in the 1950s but became a successful manager of champion wrestlers in the 1970s, according to a biography on the WWE Web site. Albano was recognizable by his penchant for unbuttoned Hawaiian shirts and a trademark beard, which was usually bound by a rubber band. His persona earned him the distinction of "one of the most hated men" in wrestling for 15 years, the WWE biography said. Albano's image evolved in the 1980s, when he teamed with Lauper on several music videos, such as "Girls Just Want to Have Fun," and wrestling appearances. As his celebrity status grew, Albano landed acting jobs, including a role on several episodes of the "Miami Vice" TV series, the biography said. Albano became a cartoon in 1989, when he was the voice of Mario "Jumpman" Mario for 17 episodes of "The Super Mario Bros. Super Show!" according to the Internet Movie Database. CNN's Jack Hannah and Denise Quan contributed to this report.